New York, NY: Not published, 1863. Book. Very good+ condition. Unbound. Signed by Author(s). No edition. Octavo (8vo). One page letter (war date). Dated April 9th 1863. Written to a Miss Harris, apparently in response to her request for his permission (and an example of?) his autograph to use on a patriotic quilt. 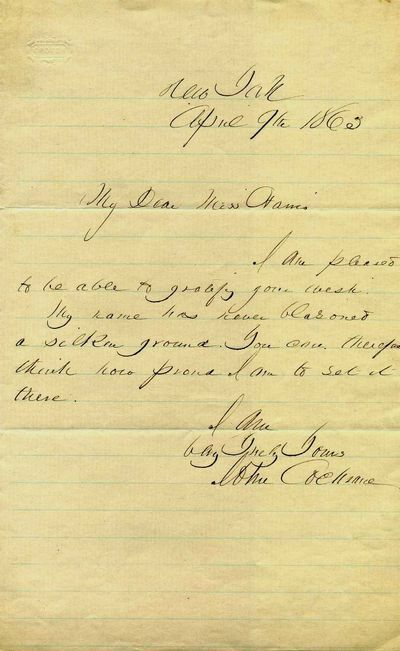 The letter reads "My Dear Miss Harris, I am pleased to be able to gratify your wish. My name has never blasoned a silken ground. You can therefore think how proud I am to see it there. I am, very truly yours [signed] John Cochrane." Lawyer, U.S. Representative from New York 6th District from 1857-1861 and defeated; delegate to Democratic National Convention NY 1860; General in the Union Army during the Civil War; NY State Attorney General 1864-65; Delegate to Republican National Convention from NY 1868. Military, Americana, Quilting, Domestic Arts..